Marée Basse at the Barbican. Photo: Vincent d’Eaubonne. If melancholy could be visualised, it might well look like Sacekripa’s world within the Barbican’s Pit theatre. A black curtain borders the stage with thick pieces of wood accenting the lines of the room, eliciting a makeshift feel. The space is cluttered with skewed shelves, myriad bottles of half-drunk wine and only half a bag of apples for sustenance in sight. There’s also a photograph of a dog precariously hung up on the centre beam, a strange sentimental touch in an otherwise stark environment. The space summons images of student living in days of desolate squalor. Even more nostalgic is the television set that projects blue light, equipped with a VHS player. There’s a sense of liberation that comes hand in hand with dialogue-free performance. Firstly, the noises that the performers do make become far more loaded, every grunt or laugh ripples through the atmosphere with greater impact. Secondly, the audience’s response becomes more vital, in this instance a child’s giggle was a consistent and wonderful companion. Two faded variety acrobats inhabit this world, devised and performed by Benjamin De Matteïs and Mickaël Le Guen. With their former glory behind them and a lack of opportunity to demonstrate their talent, they navigate domesticity using elaborate but misjudged tricks to whittle the time away. Their movements, exacerbated by intoxication, are without grace but hint at a former playfulness that now appears to be dying. Armed with knives, cups and apples, the duo perform numerous tricks for one another’s entertainment, though it appears the ultimate prize is to guzzle as much wine as possible. For the two men in Marée Basse time is a less valuable asset than effort. Functionality is bypassed for intricacy, with a system of pulleys being used to access to various objects in their home. The physicality of the duo plays on the classic trope of opposites. Le Guen is the first to stumble onto the stage, desperately trying to gain access to an apple which is tantalisingly out of reach. Instead of dragging a chair over from the other side of the room, he pulls open the oven to benefit from minimal elevation. His face is scrunched for the entire performance as if he’s engulfed a medley of citrus fruits before entering. There’s a childlike innocence spread across his features that urges us to forgive the idiocy of his movements and allows him space to make countless ill-judged decisions. The first gesture which resonates with the audience and awards him a belly laugh is one where he falls straight through a chair. Simple moment like this are masterfully judged. In contrast, De Matteïs is a burly bearded performer whose towering stature is increased when juxtaposed with Le Guen’s scrawny frame. He makes the most of his affable face by winking and nodding at the audience on repeat, seemingly more in the know that his partner. Skilled with a knife, De Matteïs brings a sense of danger; from throwing knives to performing awe-inspiring lifts, we’re never truly certain that his friend will come out unharmed. The danger speaks to a larger current of sadness with permeates Marée Basse. In one moment, the pair attempts to re-enact their former routine, yet fail to complete it. Wheezy, bloated and aged, the performers are far removed from what they presumably once were; even their costumes appear strikingly unsuited for their new bodies. The desperate state of things is best realised in the final moment of the show which has the performers retiring to their chairs to watch a children’s television show with their backs to the audience. The cutesy sound bellowing out from the screen is pure escapism, particularly jarring giving the lack of noise which precedes it. 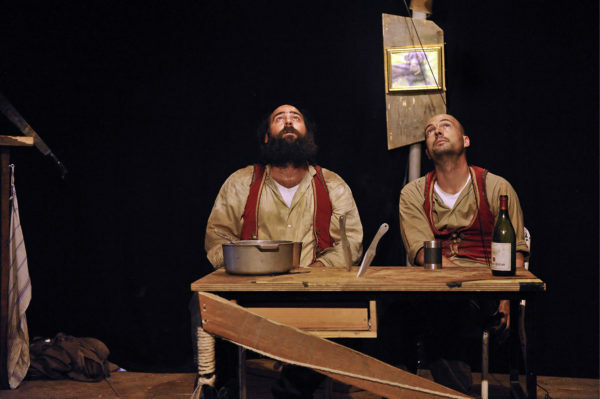 Marée Basse is a sophisticated show which functions by blending joyous physical comedy with larger truths about dreams and the failure to maintain them. Marée Basse is on until 21st January 2017 at the Barbican. Click here for more details.